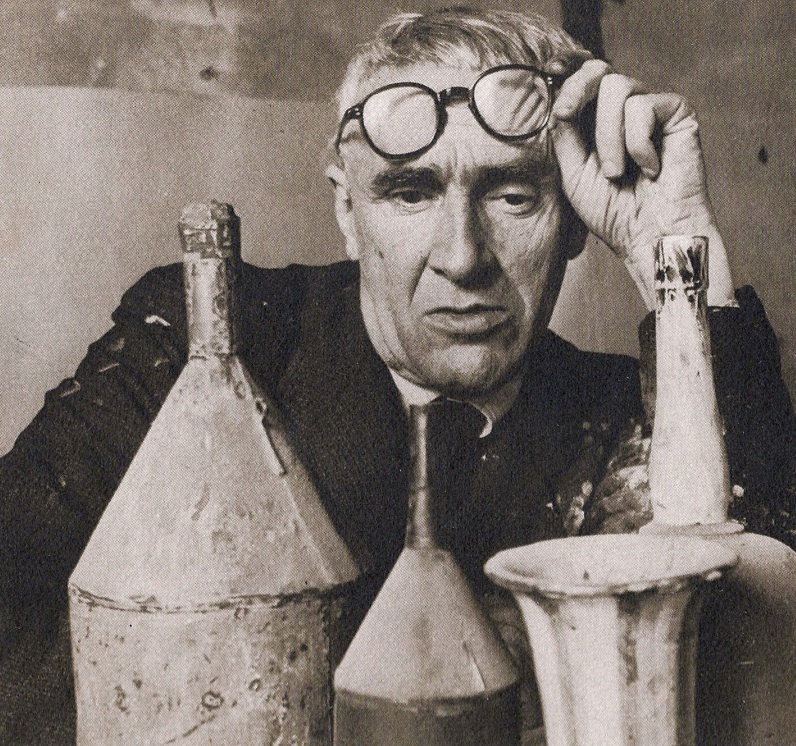 Morandi, the sage of Grizzana, spent much of his life making just such simple pictures – little more than a few bottles, pitchers, and vases, perhaps a box or two, occasionally a ball or candlestick. The objects sit or lie in clusters, in arrangements ever varying, but ultimately very similar. Their pictorial space evokes an indefinite physical space, a little like a close-up shot of a wide table, such that one can, almost never, see the edges or the legs. Perhaps it is a marble butchers’ slab, as one still sees in Bologna’s macellerie (Morandi spent his life living with his 3 elder sisters in Bologna). Yet how large this slab must be, to hold so many objects and still be so empty. The work is emphatically figurative, yet has hints of abstract painting yet to come. So much for the paintings. At the Estorick Collection (a fantastic little museum dedicated to 20th c. Italian art in Islington) they display perhaps 30 works, mostly etchings but also a few drawings, and one painting. It’s a fine show. 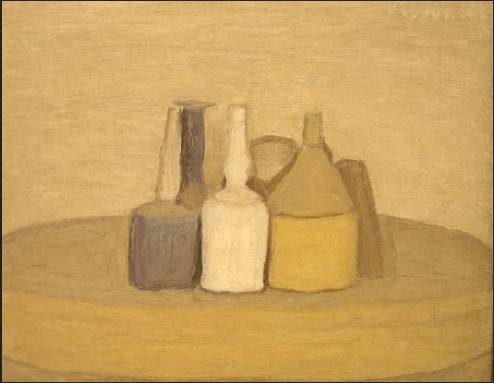 It illustrates a different side of Morandi, without the distraction of colours or paint-stroke. I’ve always thought his “negative space”, the space “between the dish and the pitcher”, is superb. 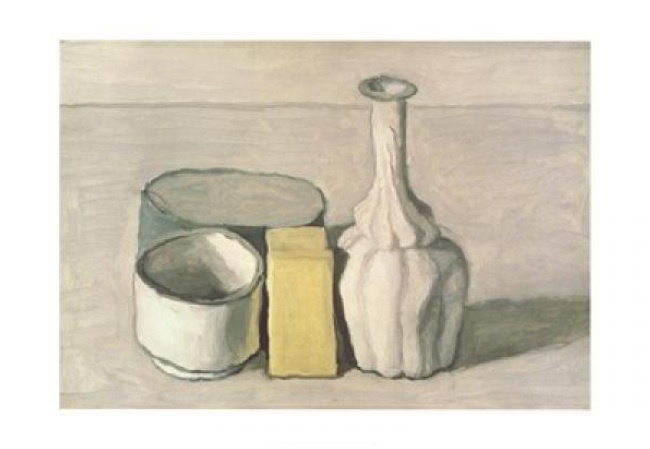 Of course, any figurative painting has negative space – but because Morandi blanks out his background, and manipulates the same 20 objects in much of his classic-period work, the viewer’s perception of negative space is heightened, it becomes the image’s focal centre. Another element that struck me was the attention he paid to his backgrounds: some are circular, others of an irregular shape. Again, such austere compositions force an emphasis on the background, and the circles in particular work very well against the rectangular framing of the page. Lastly, the horizontal bands of the paintings, that pass for fore- and back-ground, are echoed as very distinct spaces in the etchings. 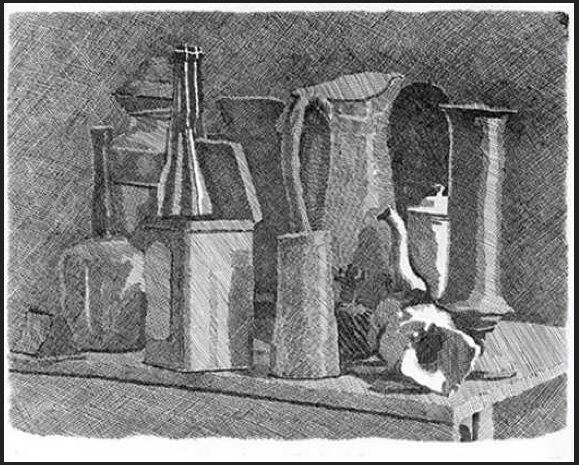 Etching, of course, unlike drawing, is mostly not a spontaneous or immediate process, due to the great care, equipment and planning required, and so the prints in the Estorick can’t easily illuminate, for the viewer, Morandi’s process. However, they serve as a counterpoint to the paintings; the viewer sees what this most formally disciplined of painters could do in that most technically complex and disciplined of media, etching. The few drawings are interesting, in that they have an immediacy so different from his meticulous etchings and paintings: one can imagine he was actually sketching the pots, the lines are broken, over-drawn, erased out, roughly shaded. The strokes are irregular, as if he is trying out countless arrangements, yet there is little of that frantic “searching for volume via pencil” that one finds in, say, Giacometti’s sketches and indeed the paintings. Those that are interested could do worse than visit the Morandi Museum in Bologna, buy the excellent comprehensive catalogue (Charta ed. ), and reward themselves with a platter of bollito misto at the rather old-school Restaurant Diana.